Some things work really well together, I thought to myself, and I embarked on this little journey of combining fashion illustration with stylish patterns. I wanted to create fresh and feminine images inspired by floral patterns, mostly roses, in a trendy colour palette. You can see the results on my homepage. 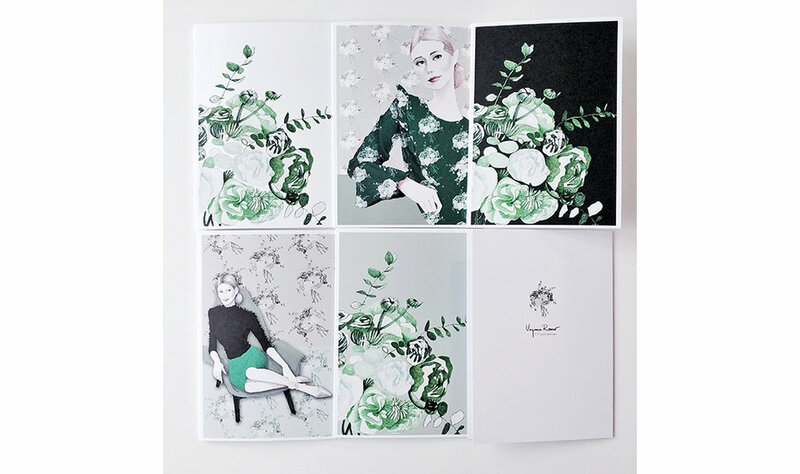 In line with my licensing work, I even created my own postcards with those images, adding the predominant green tone from my own brand in the best hope that it will trigger the spring to come around. You can download* the images to print your own cards, if you want. Just go to my freebies page. This will give you access to all freebies (new ones come monthly), including these postcards. And when you have downloaded and used the image, please share it with me on Instagram!